Del Mar Heights counts on parents, alumni, and community members to make our school such a wonderful place for our children to learn and grow. We have always been lucky to have parents that give so much of their time, energy, and creative juices; which has helped make our school a special place for our children, staff and community. Your tax deductible donations make many of our programs and events possible. Rather than write dozens of small checks throughout the year for each program, we’ve consolidated fundraising to just two events —the Annual Giving Campaign in the fall and the Spring Gala. Because the PTA is a (501)(c)(3) nonprofit organization, your donations are tax deductible. Our Tax ID number is 33-0708127. We are asking each family for an annual donation of $250 to directly support Del Mar Heights. Parents and community members donate in a broad range, from the annual membership fee of $25 to as much as $30,000; and a number of families choose to donate in the $500 to $2000 range. 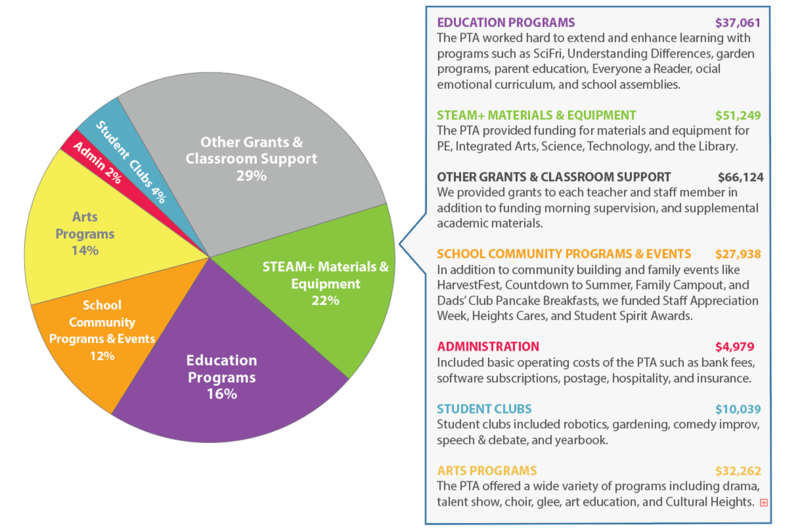 This is separate from your Del Mar Schools Education Foundation donation (which helps the district pay the salaries of our physical education, art, science, and technology teachers). ​Do I get a say in how the money is spent? Yep! PTA membership is included at the $25 level or above. Through member meetings, parent surveys and volunteer programs, you can get involved and help shape how the funds are used. Where does my donation to the Del Mar Heights PTA go? For a full copy of our proposed budget for 2018-2019, click here. Many companies have programs through which they will "match" the charitable contributions made by their employees. ​Corporate matching gifts are a great way to maximize your personal contribution to our school and increase the impact of your gift. ​Each company has its own guidelines for matching that are fairly simple. Check with your company's Human Resources office to see if they offer gift matching. Questions? Please contact PTA President Mireille Barnard.